You know that rule about not trying out new recipes when you have guests over? I have to admit that I have blatantly broken that rule for years. I have what some might call a bit of a stubborn streak, and that rule just didn’t fly for me. I want my guests to eat something interesting and delicious, and after I’ve already made a dish, it’s not as interesting to me. Which is an adaptive feeling to have as a food blogger. I have been trying to do better about not using guests as guinea pigs as I’ve found more recipes that I like so much that I’m excited to make for guests (like mushroom bourguignon, vegan red lentil stew, and tofu and peanutty quinoa bowls). But I was tricked into breaking this rule this weekend! 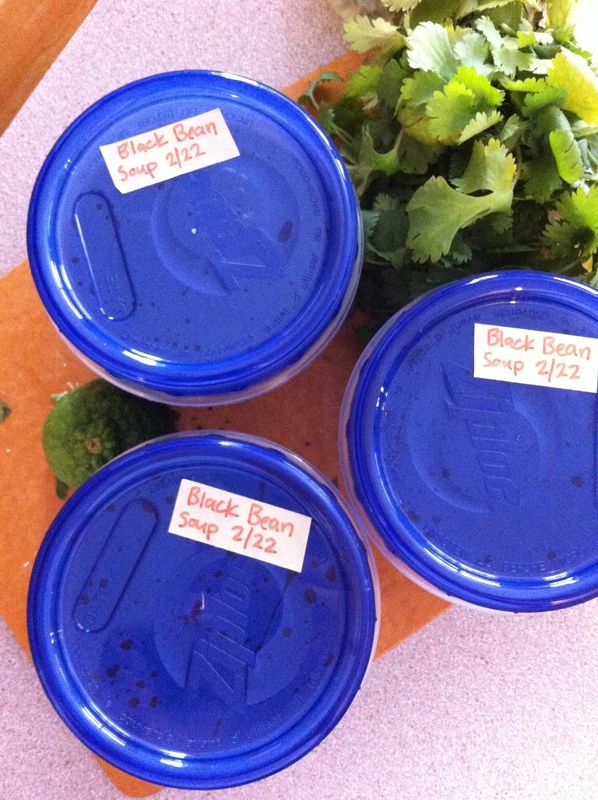 I had planned to make this black bean soup recipe from Cookie and Kate and then the husband’s friend came over to “jam” in the basement. Of course I wanted to feed them. I mean, jamming all afternoon is hard work and they would need sustenance! So I forged ahead, breaking rules and not caring. And good news–this recipe is now guest approved. The husband even requested that this go onto the “repeat list” (he must know about my adaptive feeling) and asked if it’s freezable. He knows that freezable soups often end up in his lunches, so he really must like it! This soup should be perfectly freezable. There isn’t any pasta, potatoes, or dairy that often don’t stand up to freezing and reheating. I have two bowls in the freezer, and I will update here if they don’t reheat well. 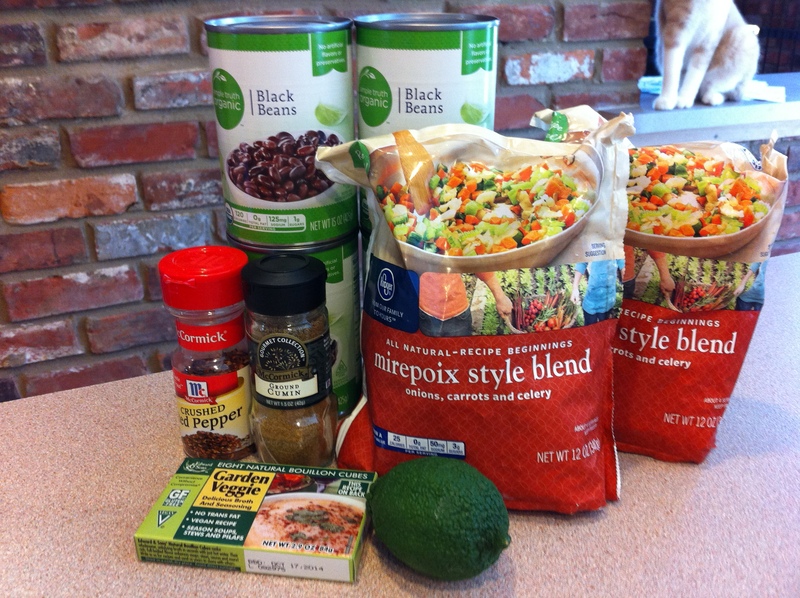 I also tested this recipe using frozen bags of mirepiox mix vegetables. While I prefer using fresh vegetables, sometimes I need a recipe that I can make completely from the pantry to avoid ordering out or turning to frozen pizza too often. This turned out perfectly. The only fresh items I used were a lime, garlic, and the optional cilantro. The fresh lime juice can be substituted with vinegar or refrigerated lemon or lime juice and jarred garlic or even powdered garlic fills in for fresh just fine. 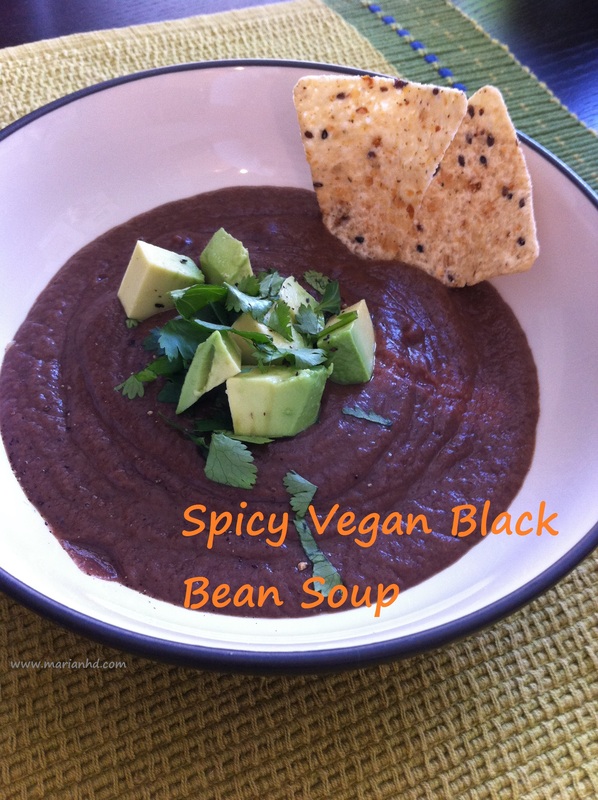 That makes this an easy recipe to pull off when Meatless Monday sneaks up on you and you haven’t had time to get to the store. 1. Heat the olive oil in a large soup pot or Dutch oven. 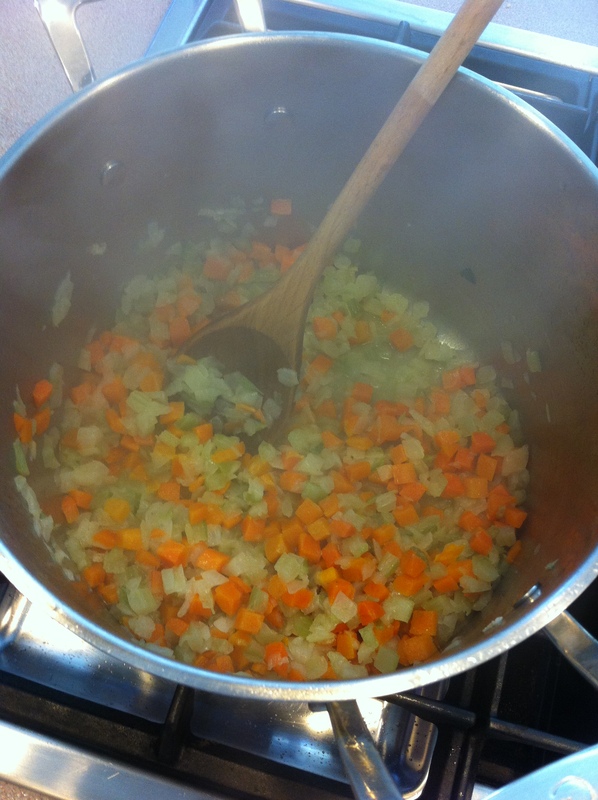 Once it’s hot, add the mirepoix mix and a dash of salt. Cook uncovered for about 10 minutes, or until the vegetables are soft. Stir occasionally. 2. Add the garlic, cumin, and red pepper flakes, stir and cook for 30 seconds. Then add the beans and broth. Bring to a simmer and cook for 30 minutes. 3. Puree the soup in a blender or with a hand blender to the texture of your liking. I got carried away and blended all of the soup completely. Feel free to leave about 1/4-1/3 of the soup unblended for some texture variation. 4. 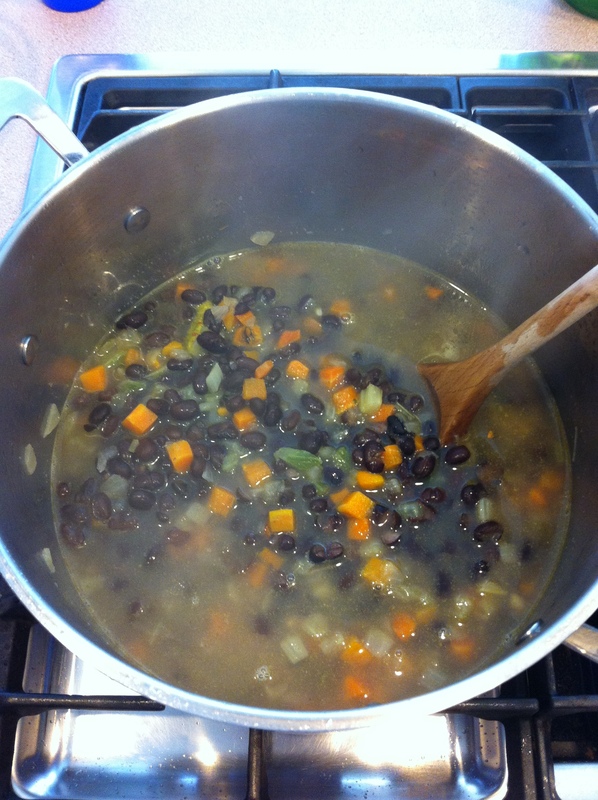 Return the soup to the pot to mix in the lime juice, salt, and pepper to taste. 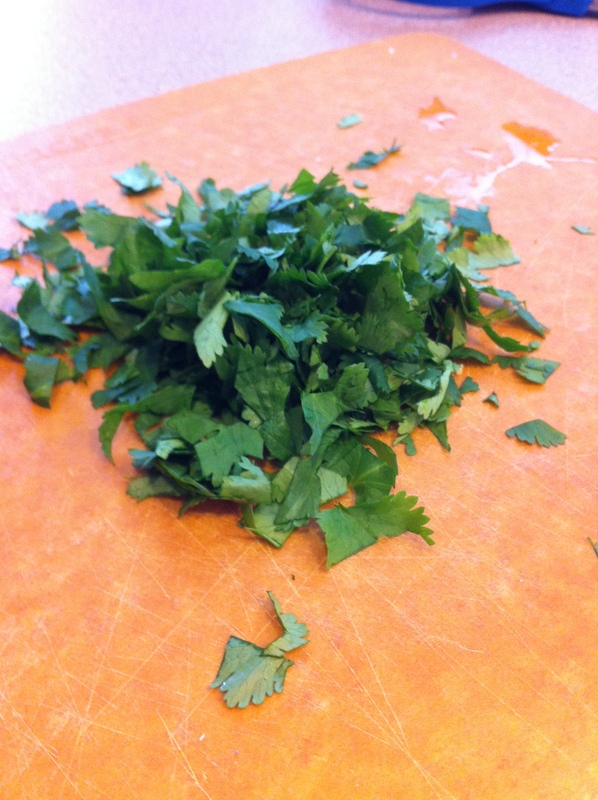 Either stir in the cilantro or garish each bowl with it. Avocado and tortilla chips make excellent additions, too. Also delicious with this homemade bread. *If you have the time or the veggies on hand, you can substitute the two bags of veggies for 2 medium onions, 3 celery ribs, and 1 large carrot, all diced. One year ago: Bukhara (amazing Indian food) in my belly! This was a tasty delicious! I highly recommend it to all… I think this is a new household staple. I love my wife! She is an amazing person and phenomenal chef!